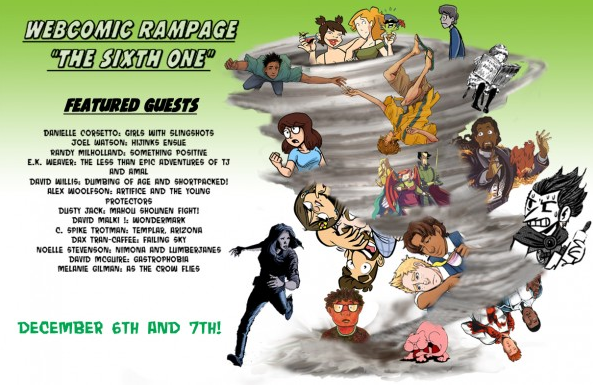 I’m loading up the car to drive to Austin right now for WEBCOMIC RAMPAGE! I’ll be debuting an all new MYSTERY BOX and a cool new contraption I’ve devised for sketches called THE SKETCH-A-MATIC. If you want to see what it is, and what THE BIG RED BUTTON does, you’ll have to come visit me at Dragon’s Lair this weekend. D-Lair was nice enough to do a write up about HE here. 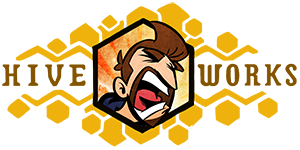 Our annual Webcomic Rampage event is fast approaching and we have a fantastic guest list with old and new creators coming to the store! Rampage will take place on December 6th and 7th! Here’s our confirmed guest list for this year: click on the links to check out their webcomics! The schedule for the weekend is also listed below. Dusty Jack and JD Saxon Mahou Shounen Fight! 1:00-7:00pm General Sales: Meet your favorite webcomic creator and purchase books, prints, and more at their tables! Live Drawing Sessions: No RSVP required, free and open to the public! Come watch the creators sketch live and talk about their process, inspirations, and get your questions answered!